Samba dance is a rhythmic and energetic dance derived from the Angolan Semba. It is characterised by fast foot and hip movements. It’s different to the ballroom samba we see danced in Europe, being much more earthy and funky! It’s not a couple dance, but can be danced by soloists or groups, boys or girls. The young people who dance with União da Mocidade learn special routines suited to parades and stage shows combines with a bit of funk/street dance alongside learning the traditional samba step Samba no Pe. The dance is very aerobic and very good for building stamina and fitness. União da Mocidade have run a number of short term dance projects since 2004 including work with Weekend Arts College, Hammersmith and West London College and the Petchey Academy. You can see some of those young dancers perform in our videos. Get fit and healthy while having fun! If you would like to initiate a dance project in partnership with União da Mocidade we would be thrilled to contribute to the cultural life of your school and would be happy to tailor our classes to suit your requirements. Please contact us. 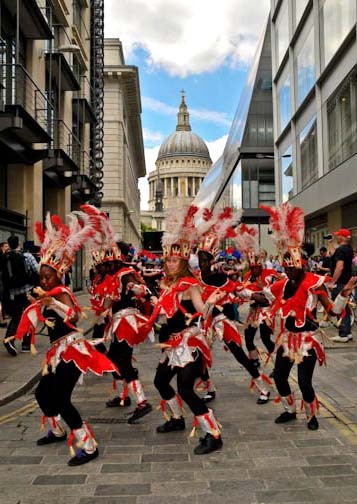 Click here to read a bit more about samba dance.